THERE. 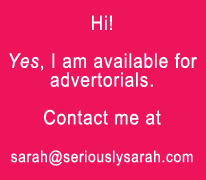 I’ve finally put a simple placeholder thingy on the side of my blog to just state I am available for advertorials or reviews since people do ask me. It’s simple for now but there you go. I’ll mark stuff as advertorials or if they’re sponsored items, I’d say it in a blog post and all. After all, I do say which ones I do get ‘access’ to and all or the ones which I just heck it all and grab it by myself. Yeaaah, this is a very short post today.